Ever come across a tutorial online that tells you to run a long terminal command, but want to know what each part of it actually means? ExplainShell does exactly that: paste in the command, and it’ll tell you what each portion of the code does. 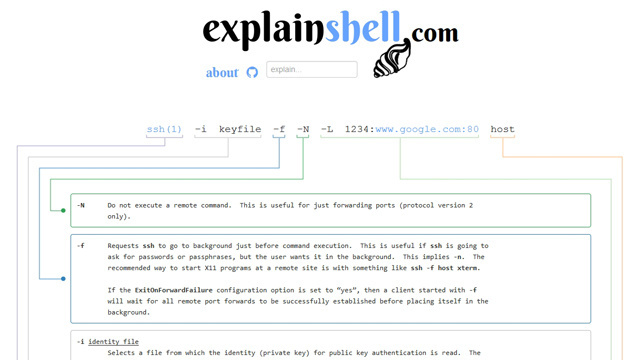 ExplainShell would explain that “-i keyfile” selects the file containing your key, “-f” runs it in the background, and so on. It doesn’t work with every command you’ll ever come across, but it’s a pretty handy tool to have in your arsenal.